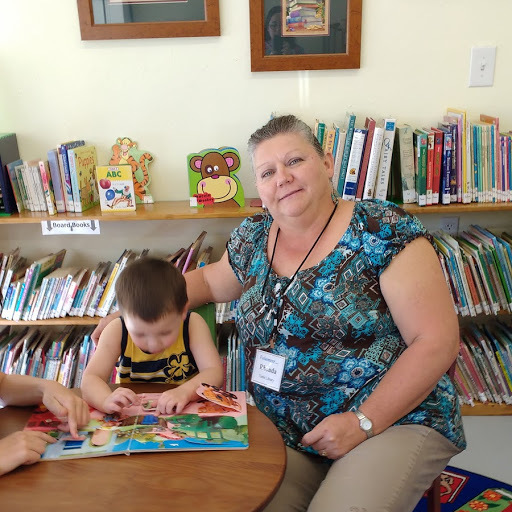 Rhonda and friends having fun during story time. 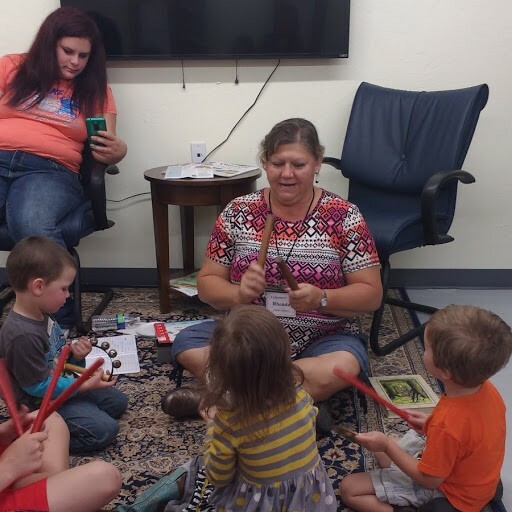 Rhonda Rogers is the Tuttle Library Preschool Coordinator donating her time and resources to our community’s preschoolers. Every Wednesday at 11 a.m. she has story and activity time. Mrs. Rhonda has 4 to 6 regulars, but if you have a preschooler, you are welcome to sign up and come on any or all Wednesdays. After a story and some fun activity, there is usually a snack. Rhonda has a passion for teaching children. She has home educated her own children since 1992, taught Missionettes and Royal Rangers for many years, served as God’s House children’s pastor, taught preschool at an education cooperative, has been a 4-H leader, and she was a leader for the teens in her home education support group.. She even had her own preschool for a couple of years. She and husband, Jim Ed, have six children and have been married 31 years. Four of their children are grown and she has one grandson, and another grandson due this month. Their daughter, AJ, goes to Tuttle High School, and son Garret is homeschooled in the fourth grade. He and Lori Dennis are Rhonda’s helpers on Wednesdays. Rhonda remembers that she began teaching children at church when she was nine years old. Rhonda’s parents were both lifelong Grady County residents raising six children in Tuttle, including Rhonda and her twin brother. Rhonda was her parent’s caregiver, with help from family members, after her parents began needing help in 2008. Her mom, Wanda Garrett, passed away in 2010; and her dad, Adrian, in 2013. As a girl, her family were custom harvesters. When school let out for summer, the family would head north and work through Kansas, Nebraska, the Dakotas, and sometimes even into Montana and Wyoming. For now, Rhonda is happy teaching our preschoolers. She also works part time as a dietary cook at the Tuttle Nursing Center. She enjoys gardening and canning, learning about herbs, camping, crafts and scrapbooking. Her family has cows, chickens, rabbits, goats, and pigs. For Rhonda, Tuttle is home sweet home, and having a library makes that even sweeter.